Henry Lee III, besides being the father of Confederate General Robert E. Lee, may be best known for his masterful eulogy of George Washington. “To the memory of the Man, first in war, first in peace, and first in the hearts of his countrymen,” was Lee’s most memorable line about the first American president. In “Light-Horse Harry Lee,”(Regnery History, 434 pages, $29.99), historian Ryan Cole offers up a comprehensive portrait of the oft-forgotten Lee whose rapid rise as a brilliant military leader was overshadowed by scandal and poverty later in life. The moniker “Light-Horse” was for recognition of his horsemanship and heroic cavalry exploits during the American Revolutionary War. Lee grew up in one of Virginia’s most prominent families. He was ambitious, studious, and attracted to the warrior spirit and ethos. Washington would have been a frequent visitor in the Lee family home. However, like other Founding Fathers, Lee’s life and legacy would prove to be much more tragic and complicated than the virtuous model that Washington made of his life. Home page photo credit: Surrender of Lord Cornwallis by the artist John Trumbull (1756-1843). Cole is adept at capturing Lee’s bravado on the battlefield as a cavalry officer beginning with the outbreak of the war. Continually seeking honor and prestige, Lee harassed and created havoc for British patrols, an especially important mission in opening supply lines for Washington’s beleaguered army at Valley Forge in 1777. At one point, the British, growing frazzled by Lee, sent out a convoy of 130 men to capture him and the young officer found himself walled off and surrounded by the enemy in a house with eight others. Miraculously, they fought back and forced a retreat against overwhelming odds. He believed that glory on the field of battle was his true destiny and a medal was commissioned in his name for a daring nighttime raid that captured the fort at Paulus Hook in New Jersey in 1779. Lee continued his success on the southern front and helped Nathaniel Greene pin down General Cornwallis at Yorktown, essentially ending the war on American terms. 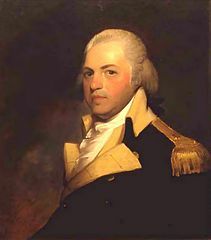 Complaining that he was not getting the proper praise and acclaim, Lee sulked about and soon left the Continental Army. His desire for more recognition, riches and prestige would ultimately result in a tragic and sad fate. Lee began to aggressively chase wild land speculation schemes that eventually buried him in mountains of debt he was unable to escape in life. In the short term, Lee settled down, married, and was a proponent of the new Constitution and became a congressman and governor of Virginia. He was known as an ardent federalist but was not afraid to buck that agenda when he felt it violated the law and spirit of the Constitution. Tragically, he defended the spirit of the Constitution by sticking up for a newspaper editor’s right to free speech against anti-federalist mobs. That earned him a bloody beating in Baltimore in 1812 that nearly left him dead. Disfigured and permanently ailing after the mob attack, Lee would never recover. He had already spent time in debtors’ prison before his final downfall at Baltimore. Lee became more desperate as his financial situation deteriorated. He traded and sold land he had already sold and embarrassingly did this to prominent figures, including years earlier to Washington. And while it’s not certain he was always acting maliciously; his reputation of being a swindler was added to one of recklessness. He could no longer make sense of his own land speculation schemes and was rebuffed by Hamilton and others for seeking inside information from government leaders on land contracts and monetary policy. One area where Cole really excels in his review is in the illuminating assessments of leaders like Washington. He notes that Washington, while less educated and scholarly than many Founders, had a deep level of emotional steadiness and virtue unmatched by his peers. Lee himself noted that nobody was more virtuous than Washington in the private arena of life. While Washington had a fondness for Lee, he later kept his distance when he saw the path of financial destruction that was awaiting the former officer in his army. Lee ended his life as a beggar and incorrigible swindler, living off the charity of others while wandering the Caribbean where he went to recover from his physical wounds after the Baltimore mob attack and to escape the never-ending line of creditors hunting him down. “The American hero, crowned with a ‘halo of fame,’ who had entered his life with prospects so fair, had ended it by swindling a kind old widow,” notes Cole of Lee’s last days. Lee swindled his way back to America and died in 1818 at the estate of Gen. Nathaniel Green’s daughter in southern Georgia, never making it back to his family. Lee never really knew his youngest son Robert Edward Lee, born in 1807. While they shared the gift of military prowess, they had enormous differences too. Lee abhorred debt and was more religious than his deist minded father. “The son was a devout Episcopalian, praying and poring over the Bible daily,” writes Cole. The son’s piety has a profound impact on shaping his humility and vowed to spend more time with his children, while the father’s pride caused him to chase schemes in search of more wealth, power, and fame. But for all his faults, Light-Horse always remained loyal to the idea of the Union. “In all local matters I shall be Virginian: in those of a general matter, I shall not forget I am an American,” declared Lee. Ultimately, his son did not share that oath. Cole notes that at every point when there was a chance that could promote civil unrest or even war in America, Lee remained loyal to the idea of a united nation and strong Constitutional government. When Virginia reclaimed his body in 1913 and Light-Horse was laid to rest at Washington & Lee University, the American flag draped his coffin as he was interred next to his son, the former commander of the Confederate Army.